I have been absent. Almost 5 months ago now, I moved long distance, back to the north - a whole story unto itself. And while doing so, I wrote a book. And cooked, styled, and photographed it. 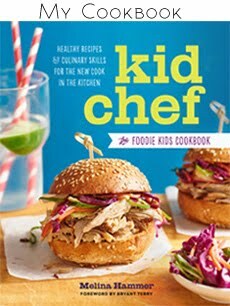 Kid Chef: Healthy Recipes & Culinary Skills for the New Cook in the Kitchen, is a fully-fledged thing, about to make its debut in the world. And it's available for pre-order now! Order your copy, here. I am incredibly proud of what this cookbook has become in the months my editors and I have spent, poring over details, asking questions, refining page-after-page-after-page. 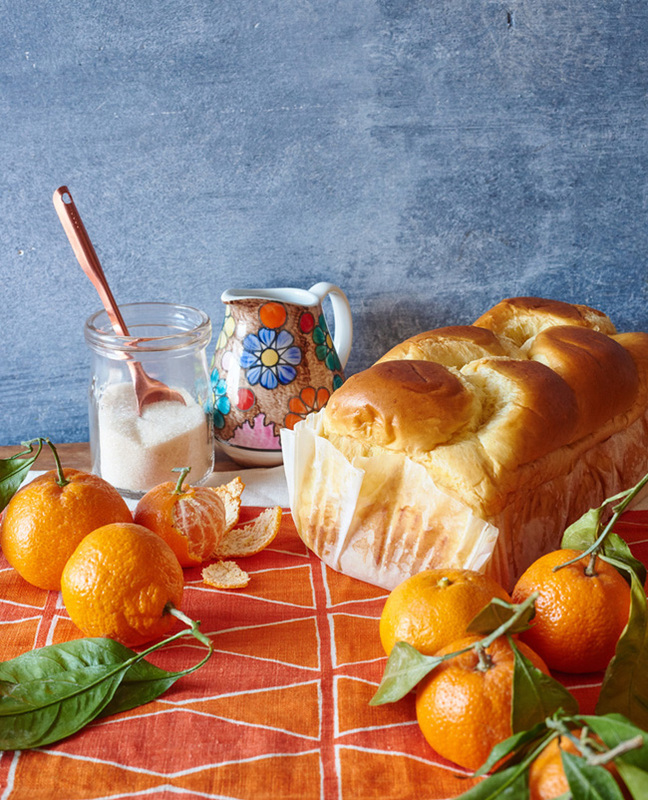 It is going to be one of those cookbooks that serves as a real resource for kids and grownups alike, packed with accessible and fantastically delicious recipes. I cannot wait to see what you think. I am offering the first 300 people who pre-order, signed prints like these, these, and these. Please email me or DM me on Instagram your address, and I'll send them your way! Thank you so very much. The making-of shot of a long-time favorite…. I cannot believe the enormity of creating the book is now behind me. That reality, and the question, "what'll I do now?" is settling in…but, this is just the beginning! Because, kids and adults everywhere will soon know about Kid Chef and be able to use it in their own lives. Wooohoooo!!! Please share your family's stories cooking from Kid Chef, by using the hashtag #kidchefcookbook on Instagram, Twitter, and Facebook. As the community unfolds, we'll have lots of sharing and connecting to do! In regular day-to-day eating, I spontaneously come up with food to feast on and post it regularly to Instagram. It happens so frequently it is difficult to carve time to post each and every recipe here, especially when I often feel like I'm "just throwing things together." Repeatedly asked what kind of food I like to cook, I have a hard time defining it because I just want to eat fresh, great food. Does that make sense? The Feedfeed gang requested a few recipes, and because they were either particularly delicious or simple to make, I wanted to be sure to share them. 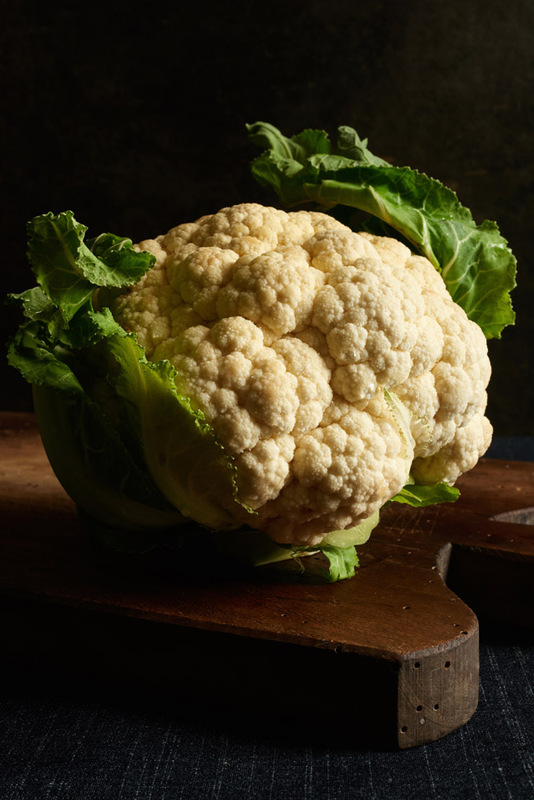 With so much beautiful cauliflower in the markets this past autumn, I made quite a number of cauliflower-centric recipes. One day I had a small epiphany while searching for something new and easy to produce that would deliver big flavor. 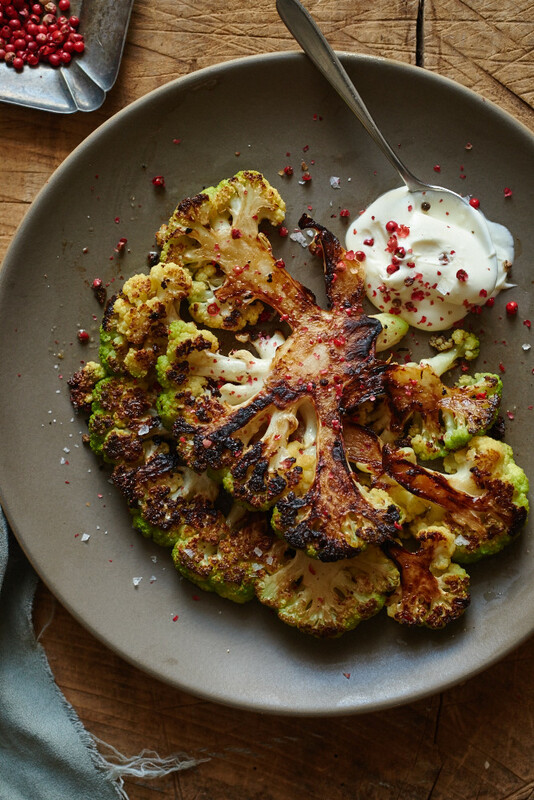 I definitely found it with this seared cauliflower steak. I made these pizzas over Valentine's weekend, using a combination of cooked-in-advance and store-bought elements. The various toppings made a verifiably *wow* pair of pies, with just little prep work to do before popping the pizzas into the oven. Worth doing on a regular basis for anyone with a busy schedule and foodie interests! 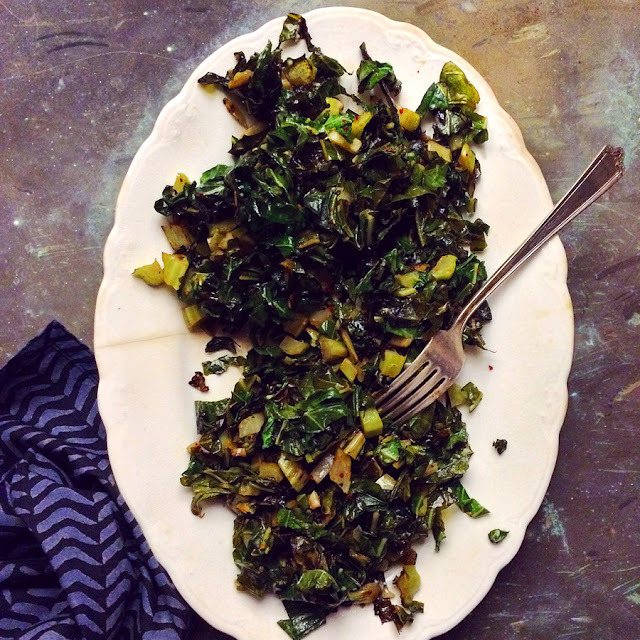 One of my favorite ways to eat is to wilt a giant bunch of greens, and either pick from it over the following days, or eat the whole pile at once. 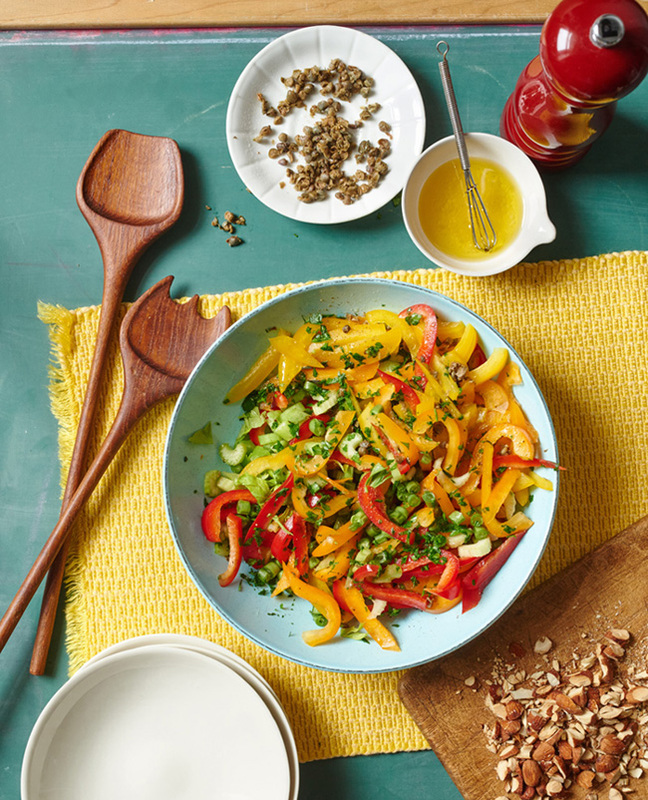 Flecked with deeply flavorful aromatics, this kind of eating is not only simple and fast, but also truly delicious, and of course, good for your health. This version was an almost-midnight creation, thrown together on a night shortly after we moved, when I needed veggie sustenance. Preheat oven to 350°. Using a double boiler, melt half the chocolate and all the butter. Be careful and maintain just a bare simmer so the water doesn't bubble up into the top saucepan, or it will ruin the chocolate. Once melted, remove pan from hot water bath, wipe the bottom of the chocolate pan with a dry dish towel to ensure no drips, stir butter-chocolate mixture together and set aside. Line an 8-inch square or rectangular baking dish with parchment long enough that paper extends beyond edges by at least 2 inches on all sides. In a large bowl, use a fork or hand mixer to thoroughly combine the eggs, sugar, and flour. Add the slightly cooled melted chocolate mixture and the remaining portion of chopped chocolate, stirring to combine all. Pour mixture into pan. Bake for 30 minutes or until a skewer comes out almost clean. If you agitate the pan the center should jiggle just a a bit. 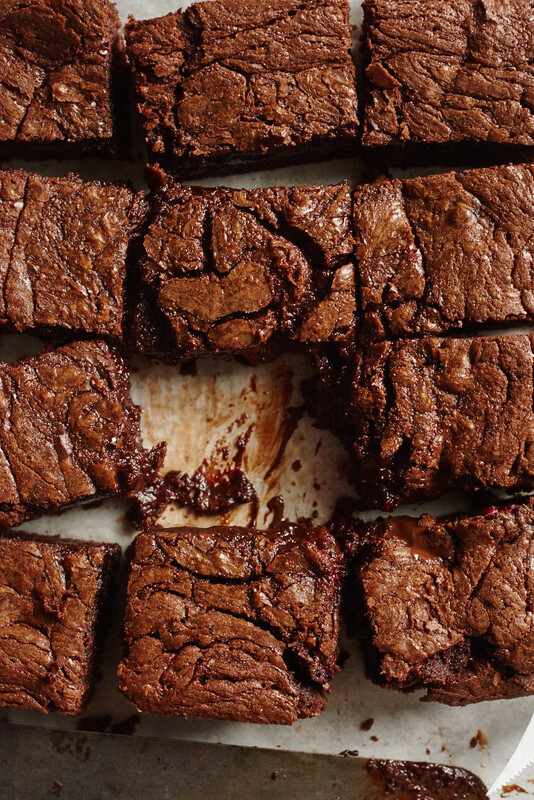 Cool brownies on a wire rack for 10 minutes in the pan, then use the parchment tabs on either side to lift pastry out. Heat a large cast-iron skillet over medium heat. When hot, drizzle enough olive oil to coat the pan. Add collard stems and sauté for 3-5 minutes, stirring occasionally. Add the chopped leaves and stir to combine. Sauté for 3 minutes, stirring occasionally, then add the garlic and stir again. Season the mixture with salt, the aleppo, and lemon juice and stir. Once the leaf membranes have softened, remove from heat and taste; adjust seasoning if needed. Transfer to plates or a serving platter and eat immediately. Heat a large cast-iron skillet over medium-high heat. When it is hot, drizzle enough oil to coat the pan. 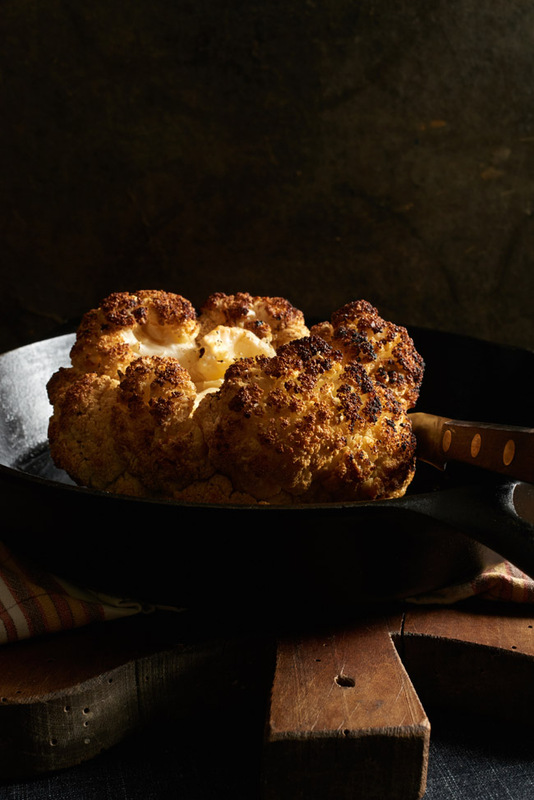 Arrange cauliflower cross-sections to fit, and sear, rotating the pan or cauliflower slices for even browning, and adding more oil as needed. A good crust needs about 8 minutes or so overall, on each side. Lower heat if needed, and using tongs and/or a thin spatula, turn to the second side, keeping the florets as intact as possible. Repeat with the second side and the remainder of the slices, transferring the cooked steaks to a serving platter or plates. To serve, sprinkle with sea salt and scatter pink peppercorns, gently crushing them between your fingers as you season. Serve alongside a dollop or two of crème fraîche and dig in. Place a pizza stone on the middle rack and preheat oven to the highest setting for 45 minutes. On a well-floured overturned baking sheet, shape dough into at least a 12-inch round, or thereabouts. Do so by making an indent with your fingertips - lined up together - 1/4-inch from the edge, all the way around. Gently stretch the dough between your hands. Make sure the entire surface is about the same thickness and lay it onto the baking sheet. Layer toppings, beginning with the leeks, followed by mushrooms, then the meat, fresh rosemary, and lastly, the cheese. I have successfully transferred the uncooked pizza to the screaming hot stone in the oven, but for a less stressful experience (and if you do not own a pizza peel), I recommend using potholders and bringing the stone out, swiftly and carefully sliding the pizza onto it by pulling its edge while tilting the baking sheet to help it slide, and then quickly replacing pizza-on-stone back into the oven. Cook for 10 minutes, or until crust is golden and charred in spots, and cheese is melted and bubbling. Remove pizza from the oven, cut into wedges, sprinkle with red pepper flakes, and eat at once. 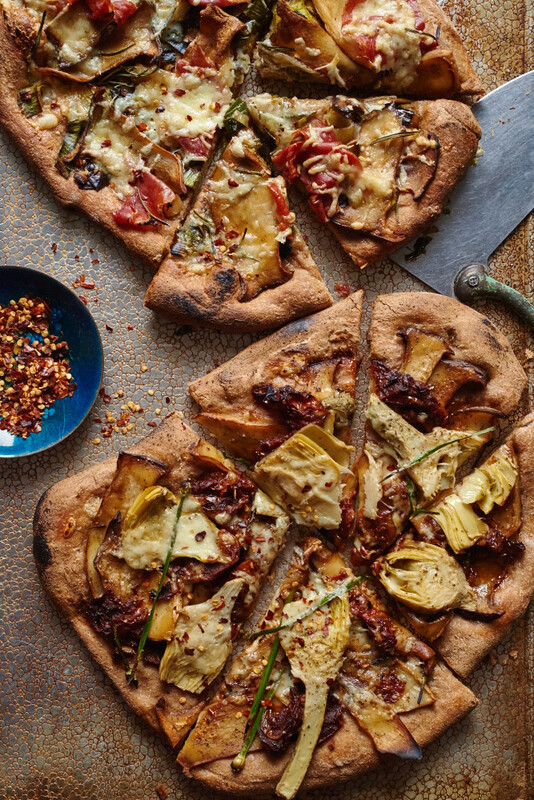 Repeat the same for the veg pizza: layer first the roasted tomatoes, then the mushrooms, followed by artichokes and chives, and finally, the cheeses, and cook it as you did the first. In other recent projects, I always love producing with my team at the New York Times. These stories have been out for a bit, but they are no less delicious than when I made them. 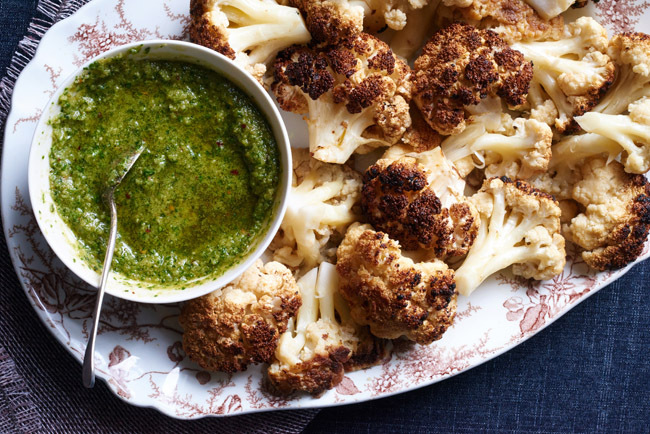 This was a beautiful Page 1 story: another fantastic preparation for the humble cauliflower…. It was so good, I've added it to my repertoire. I also produced this piece, which goes to show you that blogging, wherever you are, and sharing delicious recipes, pays off. 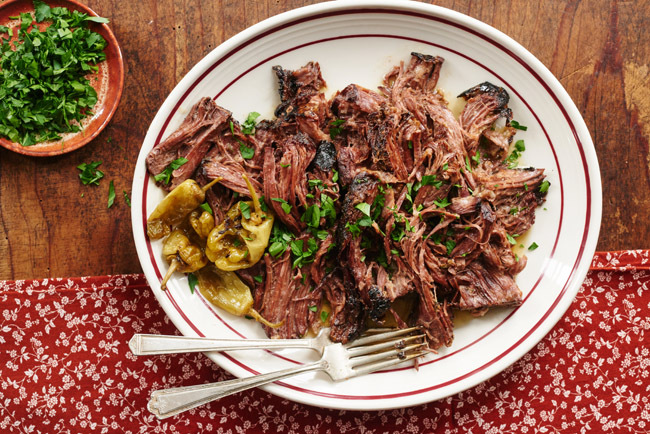 This recipe is from a wee town in Mississippi, and now, it is a famous crock pot roast. I made many tasty meals from this project. Have a delicious weekend, dear ones!